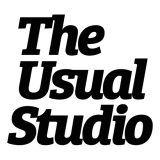 The Usual Studio is the graphic design studio of Charlee Sully, founded in 2007 we specialise in producing visual identities for fashion, arts and retail clients. Our skills include brand identity, creative strategy, content and graphic design. We like to work across branding, print, digital and interiors from our studio in Coventry; collaborating with everyone from entrepreneurs, PR's and event managers, to retailers and publishers.